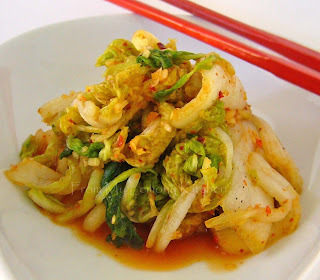 Kimchee, gimchi or kimchi... is a Korean traditional side dish. Wash, clean chinese cabbage then thicky sliced. Add seasalt ... submerge the cabbage (hold down by placing plate on top)....and marinate overnight in the refrigerator. Wash off the salt and drain in a colander. Mix the cabbage, chilli, chopped garlic and ginger into a bowl and mix well... Add sugar or salt according to one's preference. U should try Kim chi fried rice.very yummy!